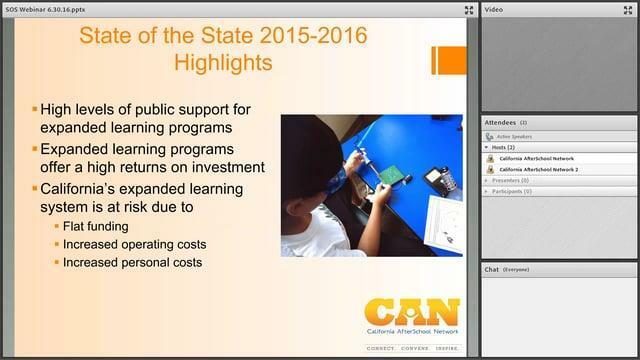 The State of the State of Expanded Learning in California 2015-2016 provides an overview of the public investment in expanded learning opportunities in California. This year’s report outlines that expanded learning programs provide after school and summer learning opportunities to nearly 500,000 of California’s students with the greatest needs through nearly 4,500 expanded learning programs. While California is ranked number one in after school nationally, there are significant fiscal challenges and unmeet need for expanded learning programs. Without relief to funding challenges, programs are being forced to reduce enrichment activities and academic supports, professional development, staff hours, and access as programs decrease the number of students served and risk closing their doors altogether. The report outlines that students who fully participate ASES or 21st CCLC after school program gain the equivalent of up to an extra 90 days of school, regular attendance in expanded learning programs increases student achievement, attendance and positive behaviors, and narrows the achievement gap, and expanded learning programs in California increase health and nutrition and offer innovative learning opportunities all year round.